The sign is a clear warning that the lack of critical thought and resistance to change is unacceptable. It’s also a reminder to be informed before taking action. Think critically, don’t assume, and challenge the norm when necessary. 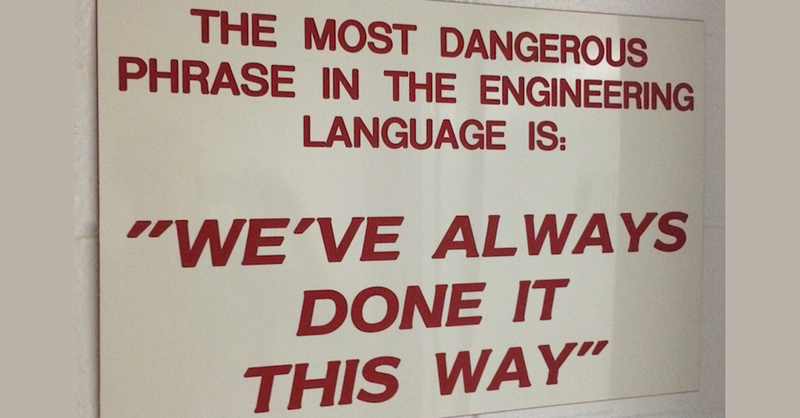 While this sentiment is important in any field, it’s particularly relevant in Facilities Maintenance. The useful lifespan of a building is so long that managing aging systems and procedures is part of the job. You can’t stay stagnant and expect to be successful, so managing change becomes your job as well. Knowing what to replace and when, reviewing procedures, and exploring new technology is part of the challenge. Why would FM pros be hesitant to change? Comfort. Some people reach a certain level of competency and then decide that they’re “good enough.”. They do their job correctly and feel changing anything would disrupt the arrangement. Confronted with imminent change, most with this mindset will go through something like the 5 stages of grief. Eventually accepting the loss, they ultimately harbor just a tiny bit more resentment for the job…but not without dragging their co-workers, family, and friends through their grieving process. Though seemingly harmless, this type of employee isn’t seeing the big picture and their passive protests waste time and energy. Defensiveness. Some feel directly threatened by the prospect of change. Changes are perceived as a signal that they may be underperforming or that technology is coming for their job. I have participated in countless lean manufacturing and similar initiatives. Every time a program was being rolled out, there’s been chatter about layoffs, or working weekends, or a buyout. Preconceived notions about change can cause a bit of paranoia. Complacency. This is the worst case. Just not caring either way. If all were right in the world it would be easy to weed out and replace the unmotivated or resentful. But it’s not always that simple. If someone doesn’t care about their job, they definitely don’t care about doing it any better. You might get a minimum effort from these types, but it will likely cost you over the long run. Whether it’s errors, mistakes, or dragging down the morale of those around them, sooner or later, you’ll feel the sting. FM has no room whatsoever for complacency! These misguided mindsets cause serious problems. Sometimes change requires more serious action. But the consequences of the ‘always done it this way’ mindset are real. Being aware is essential to manage it. Management came around a few months later when an unknown member of a facilities crew botched a compressed gas check that resulted in a leak. The leak persisted with significant loses. When you are open to shaking up the norm the returns can be very positive. The VP of Operations for a national water treatment company saw a clear value in making the switch to LogCheck. It added accountability, transparency, and saved tons of time for his team over the way it had always been done. Embracing this change paid off in an unexpected way. In response to a question at a monthly meeting, the VP presented routine maintenance metrics and records from LogCheck on the spot. Nobody had to wait an entire month to revisit the issue. The data was on-hand in his mobile device to review and make a decision, and they were able to move to new business. The team that owns the sign is one of the best run facilities/engineering teams I’ve seen. They have a culture of being open to change and determined to always improve. “We’ve always done it this way”, might apply to grandma’s secret recipe, or handcrafted whiskey aged in gluten-free braided oak barrels. But it has no place in FM. Want a simple change with demonstrable results for your routine maintenance? Get a free trial of LogCheck when you click below.